Following the success of The Dawn's first ever digital concert last September 11, One Music PH is set to bring you another one, this time featuring four of hottest and most promising female teen artists in the country, bestfriends Sue Ramirez and Kristel Fulgar, and bestfriends Maris Racal and Loisa Andalio. 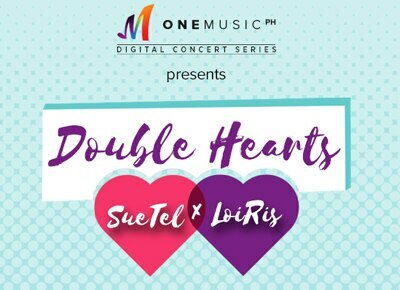 Titled Double Hearts, the digital concert will take place on October 2. Sue's singing talent has been discovered during appearances in some variety shows of ABS-CBN, including ASAP. It was also highlighted through her character in the successful teleserye Dolce Amore, Angel, who is a singer. Kristel, meanwhile, apart from being a child actress, has rose to fame because of her viral covers on YouTube. She is the first local celebrity to be given a Silver Play Button Award by the video-sharing site after gaining over 100,000 subscribers on her channel. On the other hand, Maris Racal, whose talent in singing has been shown to the public since her stay inside the Pinoy Big Brother House back in 2014. She has her debut single under Star Music, "Tanong Mo Sa Bituin." Meanwhile, Loisa, apart from currently being one of ASAP's prime dancers, has proven her talent in singing, also during her stay inside the PBB House, wherein she met Maris. Recently, her cover of Moonstar 88's "Torete" went viral. Visit http://www.onemusic.ph/ for more details.